KUALA LUMPUR, 4 Dec (Bernama) -- With pursuance to an article from Malaysian Insider dated 28th November 2014 on “Putrajaya fails to plan effectively for future Felda settlers, says report”. Y.Bhg Dato’ Faizoull Ahmad, Director General of FELDA said “FELDA has been actively plan for new generation of settlers in education, entrepreneurship as well as their social mobility”. As reported in Appendix D in 2013 Malaysian Human Development Report, in the new millennium, FELDA’s new generation has grown more than 1.6 million people. FELDA’s existence has produced a variety of professionals, successful entrepreneurs and other benefits to the nation such as a large middle income group in rural areas, new township, business and employment opportunities in rural areas as well in FELDA Group which has approxiamately 26,000 employees. FELDA has provided many incentives to its new generation through various socio-economic development programmes such as the Skills Training Programme, Higher Education Programme, entrepreneurship, housing and other incentives. Under the Skills Training Program, since 2004, FELDA has provided various training to the next generation with the aim of training 4,000 students every year in certificate levels and diplomas. For certificate levels, proficiency training is at College KINI, Institut Teknologi Utama (ITU), Giat MARA Centre, Institut Kemahiran Negara (IKN), Institut Kemahiran Belia Negara (IKBN) and other skills training institutions. For diploma levels, training is at Lim Kok Wing University College, MARA High Skills College and Malaysian Airlines System (MAS). To date, there are more than 43,000 students under these programmes. For the Higher Education Programme, FELDA offers potential students to study overseas in selected countries such United Kingdom, Ireland, United States and Australia. The courses involve professional courses such as medicine, engineering, biotechnology, accounting and so on. To date, more than 100 FELDA new generation has benefited from the scholarships. For entrepreneurship development, FELDA offers loans to the new generation to expand businesses under the FELDA Entrepreneur Incentive Scheme. To date, there are around 2,000 new generations involved in various fields such as farming, plantation, manufacturing, aquaculture, trading and crafts. At present, there are 23,000 entrepreneurs comprising of settlers and new generation. FELDA also grooms potential entrepreneurs through Tunas Mekar Programme, collaboration with Universiti Teknologi Mara (UiTM). Among successful graduates from this programme is Ramun Delights (selling chocolates and cakes) with sales revenue amounting to RM1 million a year. In addition to this, there are also FELDA new generation businesses using high technology called Effective Microorganisms (EM) technology for caring about nature. In 2013, FELDA reached another milestone by creating another FELDA Model- Sentuhan Kasih, focusing on the new generation who would gain income from the centralized modern integrated farming system and also obtain a single storey bungalow house in FELDA scheme. It uses less land than the existing FELDA Model with a minimum of 50 acres to house the integrated farming and 100 single storey bungalows. FELDA also undertakes housing projects for the new generation for those working nearby and contributing to FELDA schemes. 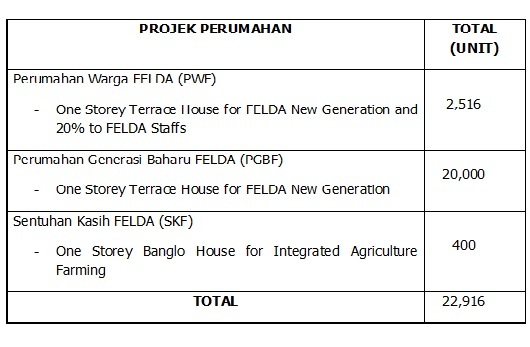 As announced by the Prime Minister Minister in the 2013 budget, FELDA will build 20,000 housing units under the New Generation Housing in 5 years (2013-2018). There are also new generation houses that have been built since 2007. Considering all the housing projects, FELDA has and is building around 23,000 housing units for FELDA’s new generation. To nurture interest among primary and secondary school students in science related, FELDA have introduced STEM LABORATORY (Science, Technology, Engineering and Mathematics) in collaboration with the Faculty of Education, Universiti Kebangsaan Malaysia and will establish STEM Laboratory for specialize from the beginning students who have talents in STEM. Through this initiative, we could expect more FELDA professional FELDA new generation in high demand science related industry. Last but not least, FELDA New Generation Blue Print report, a big scale research from UPM which the study was conducted beginning 2012 will be submitted to FELDA on 3rd week of December 2014 which will give better approach plan for FELDA New Generation. The report focus on primary and secondary education, economic development, higher education and skills training, social and personality.